I hadn’t thought much lately about Mt. 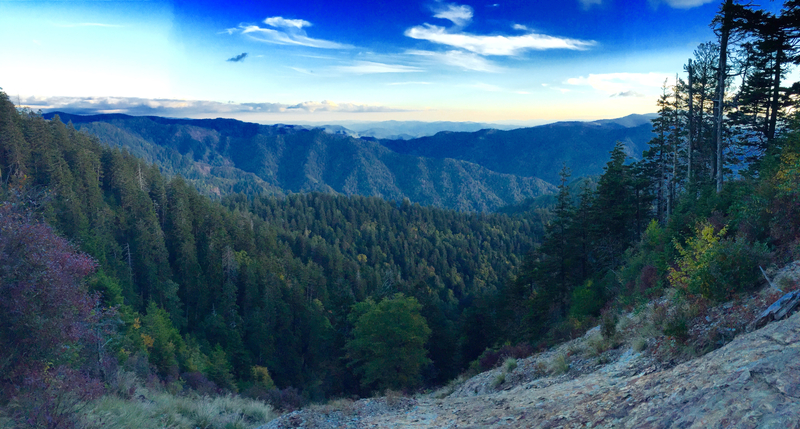 LeConte until last April (2015) when two high school seniors, Kyle McMullen and Chad Gibson, contacted me about how to hike all of the LeConte trails in one whack. I have known these young men for years, including having them in my Sunday School class when they were 10th graders. 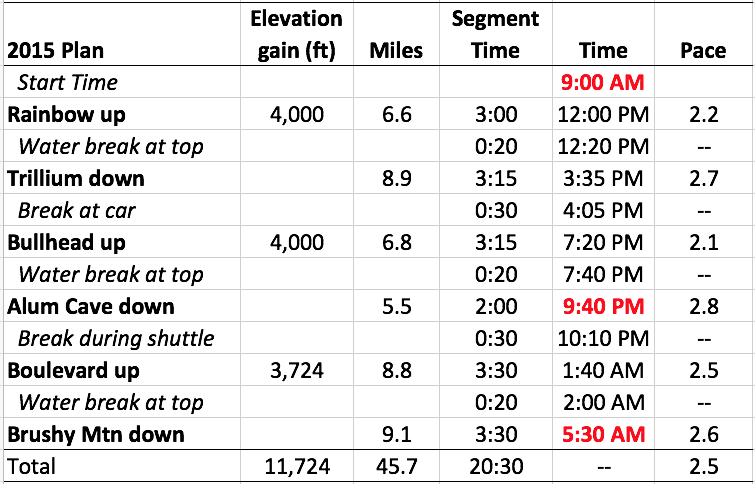 I came up with a different route that minimized transit time between trailheads. I would start in the morning instead of late at night (we started at midnight). We were already pretty tired from being up all day. We ended up going over 40 hours without sleep. If you start soon after waking up and are able to get some sleep the next day after finishing, you could gain 12-14 hours of sleep. With this route, you would leave a car at the finish (Greenbriar) and drive to the start (Rainbow). 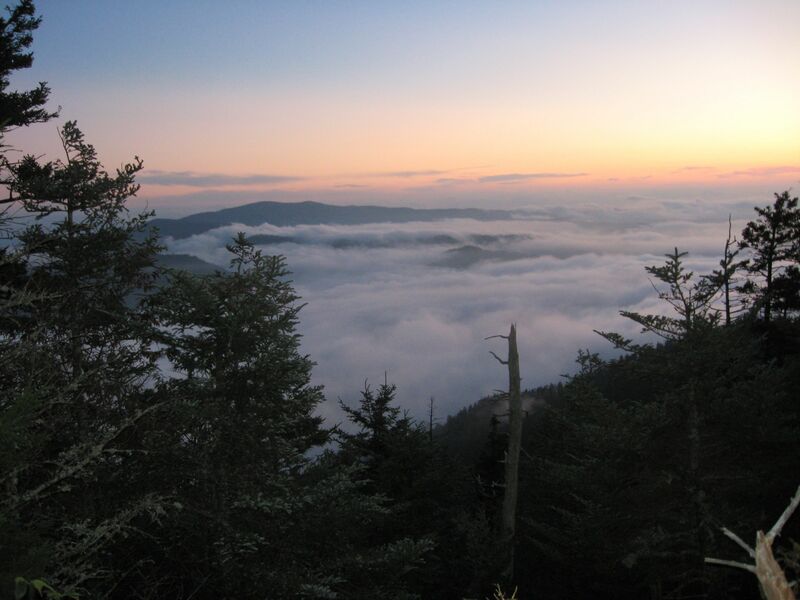 You would need someone to meet you at Alum Cave to drive you to Newfound Gap to start the Boulevard. Once the juices started flowing, I had no other option than to call Shawn and ask if he was ready to try it again. 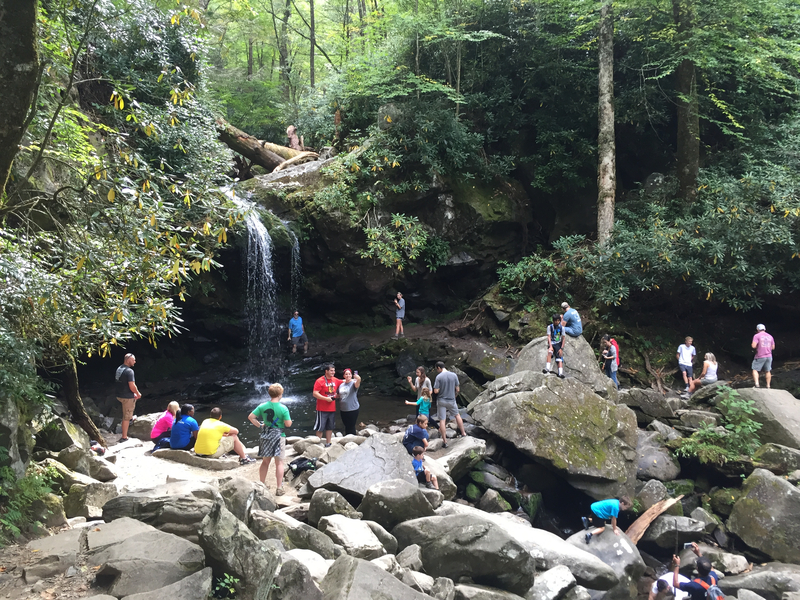 He was very excited about the idea, but was in the midst of finishing up his 900 miler – hiking all trails in the Great Smoky Mountain National Park. He said he would be done over the summer and perhaps we could revisit the idea at that point. 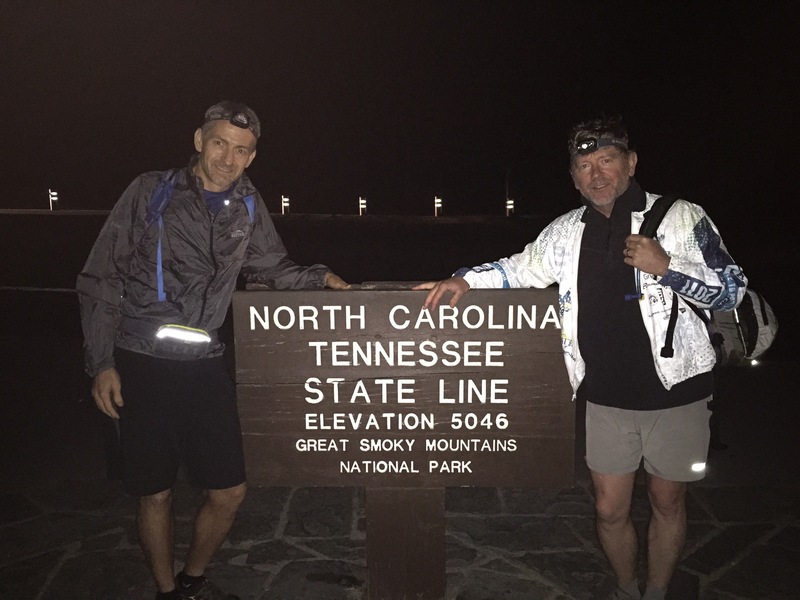 On August 9, 2015, the following text showed up on my phone from Shawn: “LeConte 24?” He had finished his 900 miler a few days before and was ready for another challenge. 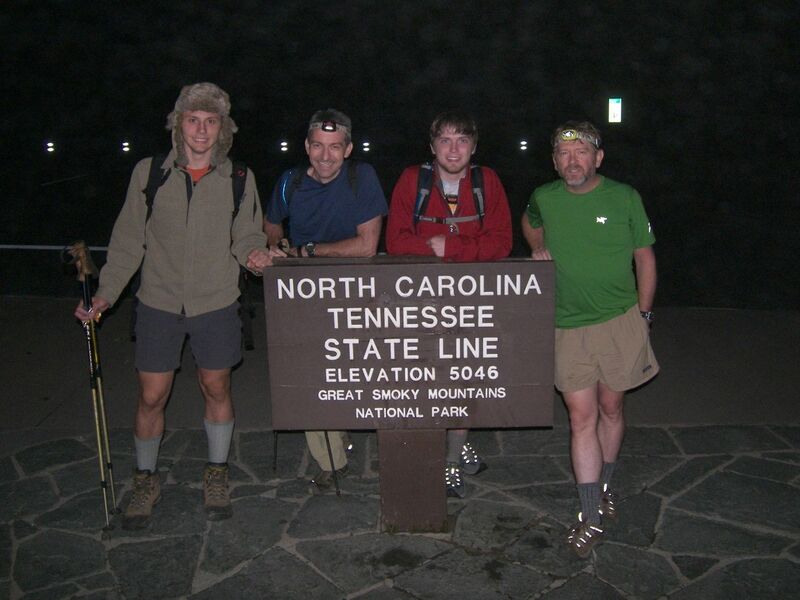 In fact, he decided that hiking all LeConte trails would be a great way to officially kick off his second 900 miler. Follow along with his 900 mile journey here: www.900milerblog.com. The first thing we did was take a look at the route we chose in 2011 to see if we would do anything differently. 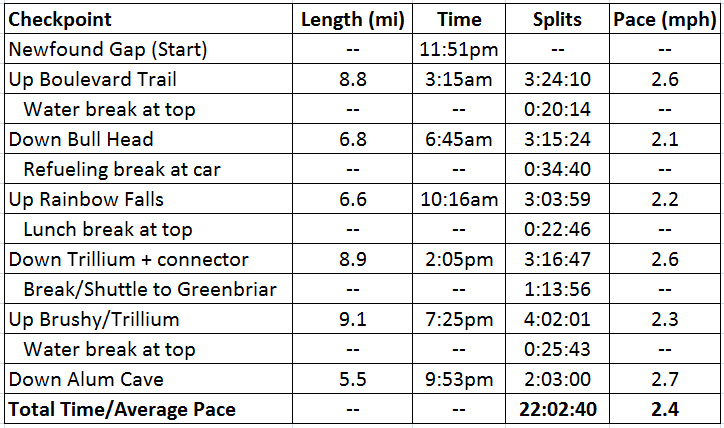 As a refresher, here is what we did then, with actual times for each segment. After thoroughly analyzing the route, we decided that the shuttle to Greenbriar took too long. We remembered that our legs almost revolted when we told them to begin climbing the long gravel road at Parson’s Branch after getting out of the car. After preparing our gear and nutrition the night before and getting a good night’s sleep, we left my house in Sevierville at 7am on Saturday morning driving both of our vehicles. There were several magnificent views of LeConte on our way to the Porter’s Creek trailhead in the Greenbriar area. We dropped off Shawn’s car and would not see it again until the next morning. We left it stocked with chocolate milk to dream about for the next 46 miles. We then drove my car to the Rainbow Falls trailhead, asked a fellow hiker to snap a quick photo at the trail sign and began our first ascent at 8:30am. 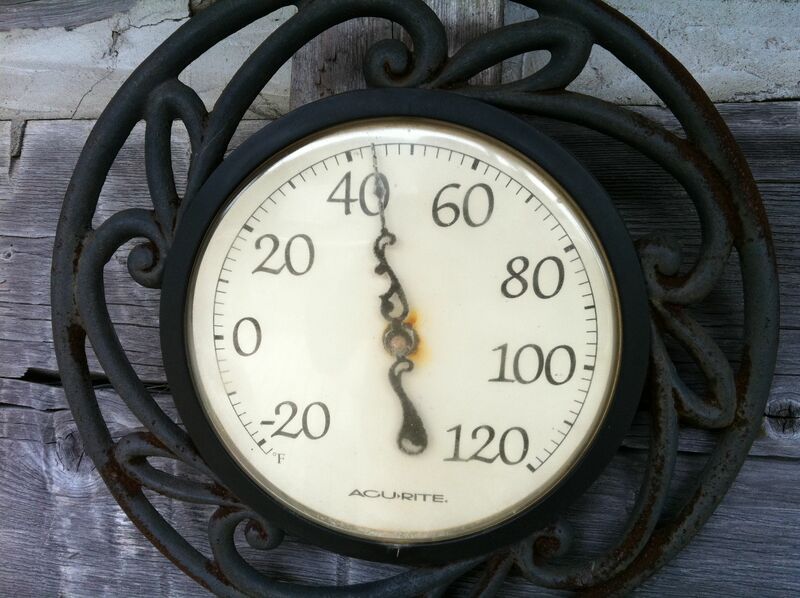 The temperature was a comfortable 60 degrees, with a prediction of a sunny day with highs in the low 80s. We intentionally took things nice and easy, keeping our heart rates around 125 bpm. We made it to Rainbow Falls (2.7 miles) in about an hour. A few hours later, we posed for the traditional photo in front of the lodge at 11:17am, grabbed a snack, and began down Trillium Gap trail. After descending 3.6 miles, we came to a junction. Our thoughts at this point: Going left would send us back towards our car, going right is Brushy Mtn trail (that we will do as our last trail), and going straight will lead us up the 0.4 mile spur trail to the top of Brushy Mtn. While this spur trail isn’t part of what we wanted to accomplish today, we decided to do it anyway. With Shawn starting his next 900 miler, not getting this trail out of the way now would mean he would need to hike at least 10 miles extra just to get to this short trail at a later date. The views of LeConte and of Pigeon Forge and Sevierville from the top of Brushy Mtn were worth the extra effort (0.8 miles, 200’ elevation gain, 24 minutes). We continued on and found a party going on at Grotto Falls. People were taking turns getting their photo made standing behind the falls. Some were playing in the water, while others were eating a snack and resting. I got a kick out of a “weight-challenged” lady sitting on a rock. She paused her cellphone conversation to offer me encouragement. She told me the way back down would be easier than the way up (Grotto Falls is 1.3 miles from the trailhead). I encouraged her as well. 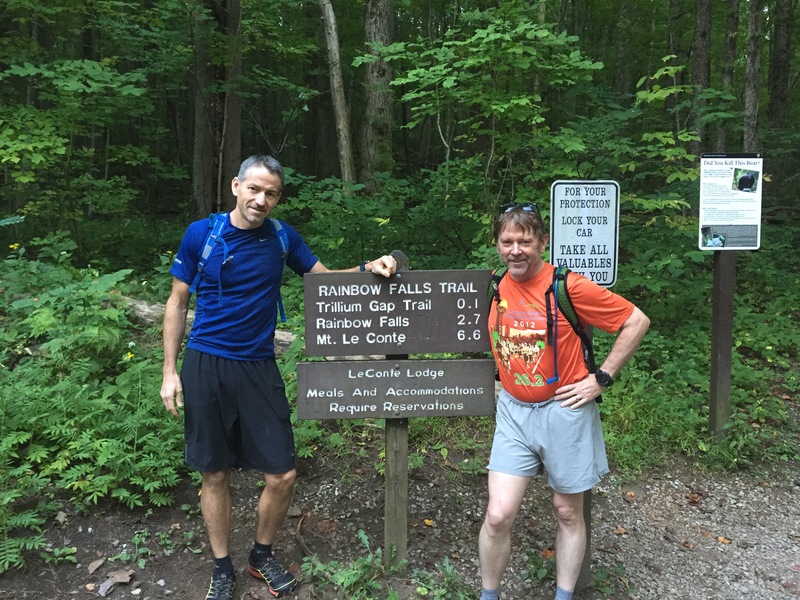 We took a left at the Trillium Gap trailhead and hiked the gently rolling connector trail back to where we’d parked. We made it back to the car a few minutes after 3pm. We spent 20 minutes at the car eating “lunch”, refilling our water bladders, and stocking up on food for the trail. About halfway up, we passed 3 guys that warned us about bees that were residing in a stump alongside the trail. They had been stung and wanted us to be careful. We kept an eye out for their clues as to where to look. About a mile and a half later, we saw exactly what they had described. Shawn cautiously led us by the danger zone. We crept quietly and stealthily by and just about the time we felt safe again, Shawn felt a terrible sting on his left calf. The spot continued to grow and show irritation, but it didn’t slow him down one bit. Incidentally, four years ago, Tyler, Davis, and I were stung on this trail, while Shawn skated by. Now we’re even! About a mile after the bees, we ran across 4 nice ladies that we had seen on the Trillium Gap trail earlier in the day. They were completing a very ambitious day hike of climbing Trillium Gap and descending Bullhead. Once they realized that they had seen us before, they said “What are you doing?! ?” Although we stopped and chatted with most everyone we passed, we rarely explained our plans. We decided to share our agenda. Their next question was “Why?! ?” We answered that we simply wanted to challenge ourselves to see if we could do it. They offered great encouragement as they cheered us on. We stopped for a snack at the top of Bullhead, before descending Alum Cave Bluff trail. We were both still feeling relatively good at this point. We enjoyed the remarkable views on the way down, including a colorful sunset around 7:30pm. 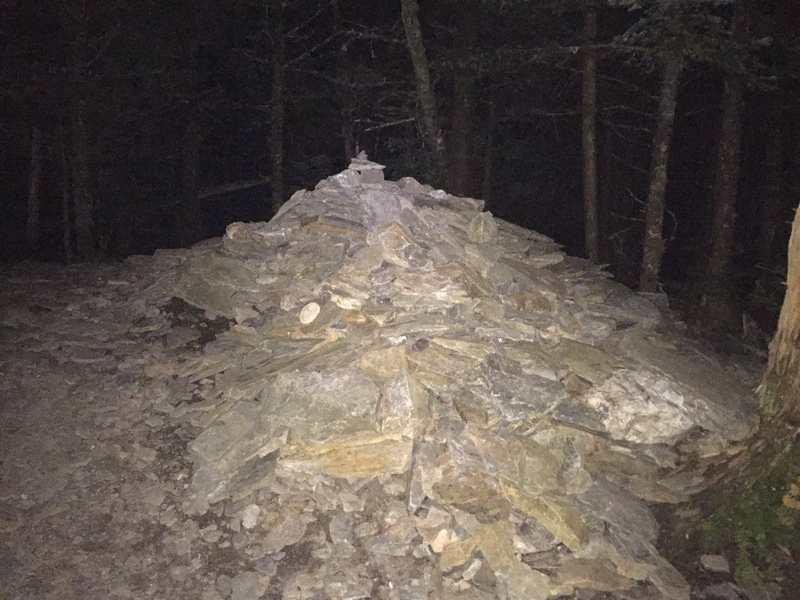 We hiked the final 2 miles of Alum Cave Bluff trail in the dark (with the help of headlamps). We found my wife, Tina, waiting for us at the trailhead with more food and water. She shuttled us to Newfound Gap, took a photo of us at the NC/TN state line, and sent us on our way. 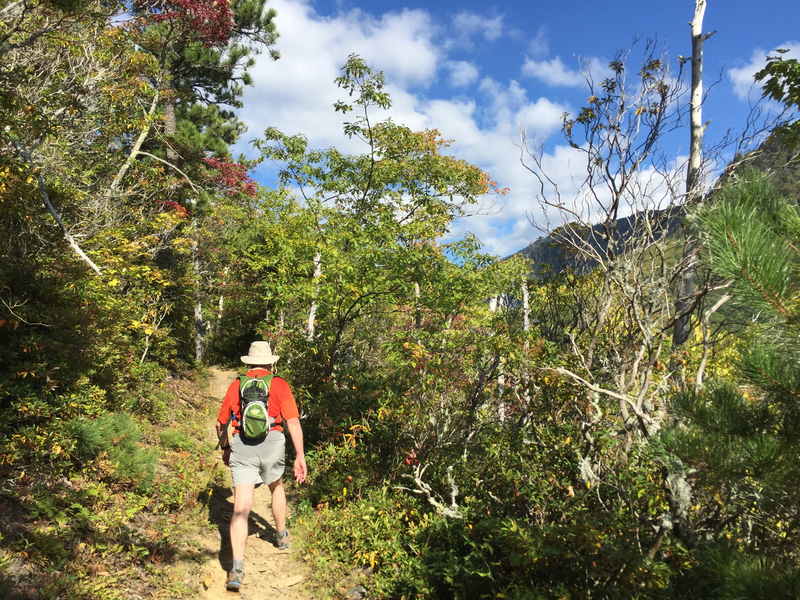 We noticed a significant drop in temperature as we got out of the car, so we donned a lightweight layer and started up the Appalachian Trail toward the Boulevard trail. Our elevated heart rates caused us to shed our jackets within about 10 minutes. We never needed them again. 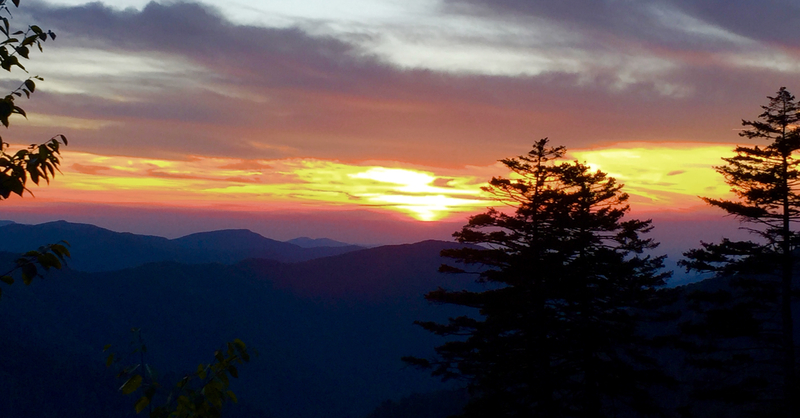 Some people have the misconception that the Boulevard trail is the easiest way to get to LeConte, since it starts around 5,000’ and LeConte is 6,594’. 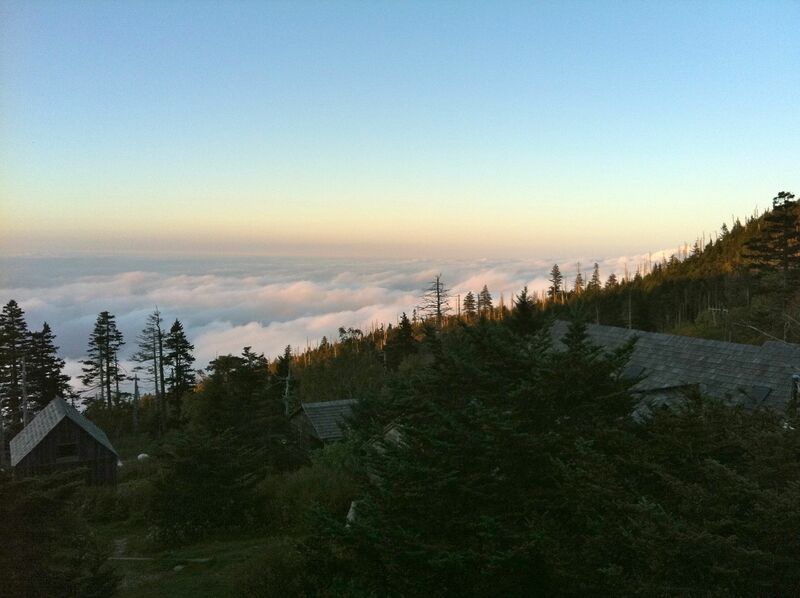 However, there is no easy way to get to LeConte. 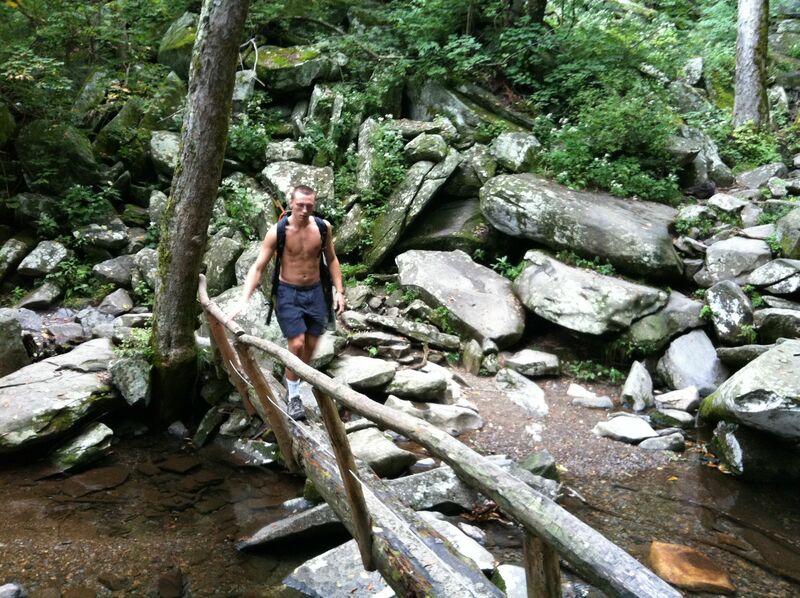 The trail climbs a little over 1,000’ along the AT in about 2.5 miles. After turning left onto the Boulevard trail, you descend back down to 5,500’ in about 1 mile and continue ups and downs for the next 3 miles. The final 2 miles involve a strenuous ascent until finally coming to the sign for Myrtle Point. We arrived at the top for the final time at midnight. We were still feeling pretty good and decided that since it was all downhill from here (basically), that we would skip break time and immediately begin our final descent. 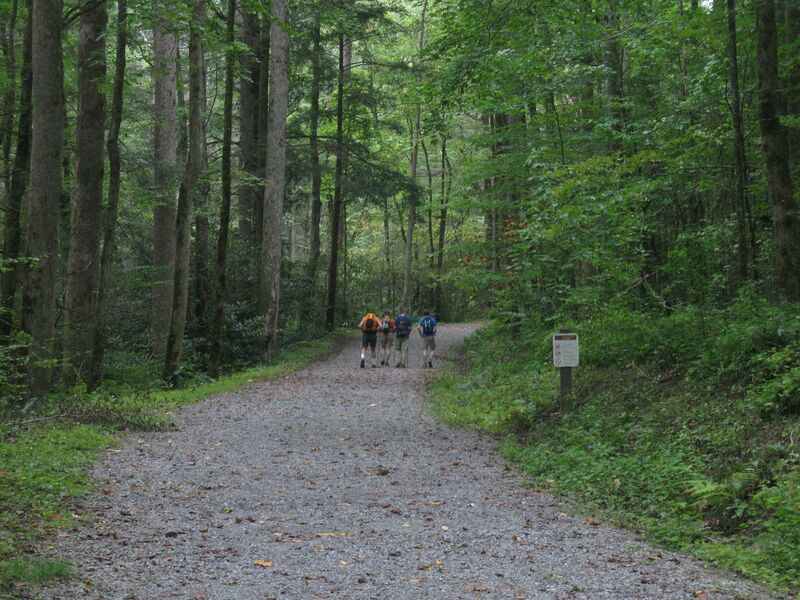 To get to the Brushy Mountain trail requires a repeat of 3.6 miles of the Trillium Gap trail. We were very glad to get off of the rocky Trillium Gap, until we turned right onto what has to be one of the worst maintained trails in the park! The first several miles of Brushy Mountain trail involved a recessed footpath with steep walls on each side that left enough room for one foot at a time to step. Weeds and overgrowth blocked our view of the rocks and roots below. It didn’t help that we were doing this section in the dark. We had to slow down our pace and take great care with every step we took. We did not want to end up with a twisted ankle in the middle of the night this far from a trailhead. Fatigue – Our muscles and joints were screaming at us to stop. Navigation – We had been relying on our Garmin GPS watches to give us a gauge for how far we had travelled, our pace, and how far we had until the next junction. Both of our watches died on our final descent. We kept mistakenly thinking that the gravel road at Porter’s Creek was just around the next bend. It was torture! Lack of nutrition – One of the things we both did wrong this time is that we didn’t eat enough on our last trip up the mountain. We ran out of energy on the way down. We both got nauseous and couldn’t eat at that point. The last several miles were a struggle just to keep putting one foot in front of the other. In hindsight, we believe that we would have finished stronger if we hadn’t stopped eating and had consumed about 1,000 more calories over the last 4 hours. We were very relieved when we finally saw the gravel road, knowing that we only had 1 mile to go! We slowly began increasing our pace, knowing that if we could maintain 3 mph, we would be finished in 20 minutes. To our delight, the bright beam from Shawn’s fancy new headlamp bounced off of the reflector stripes on the gate, signaling that we had completed our journey. We fist-bumped and checked the time. It was 4:02am which meant that we had finished in 19.5 hours. 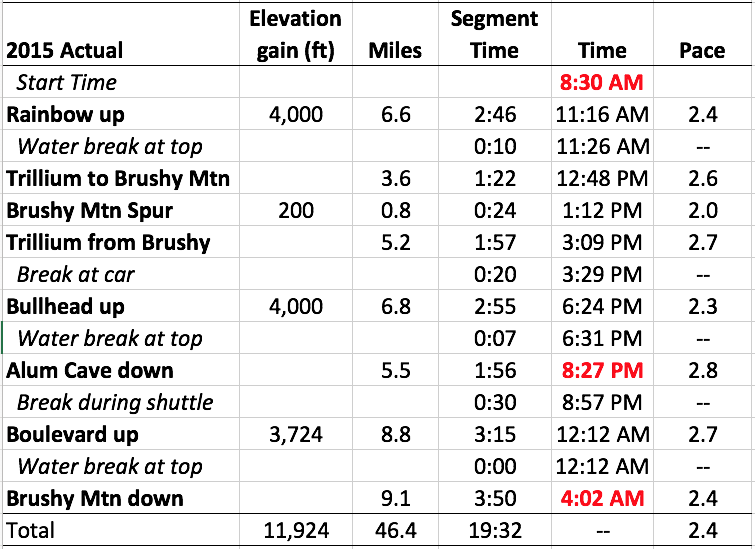 We not only beat our previous time of 22 hours, we added the Brushy Mtn spur trail (0.8 miles, 200’ elevation gain) and beat our goal of 20.5 hours. 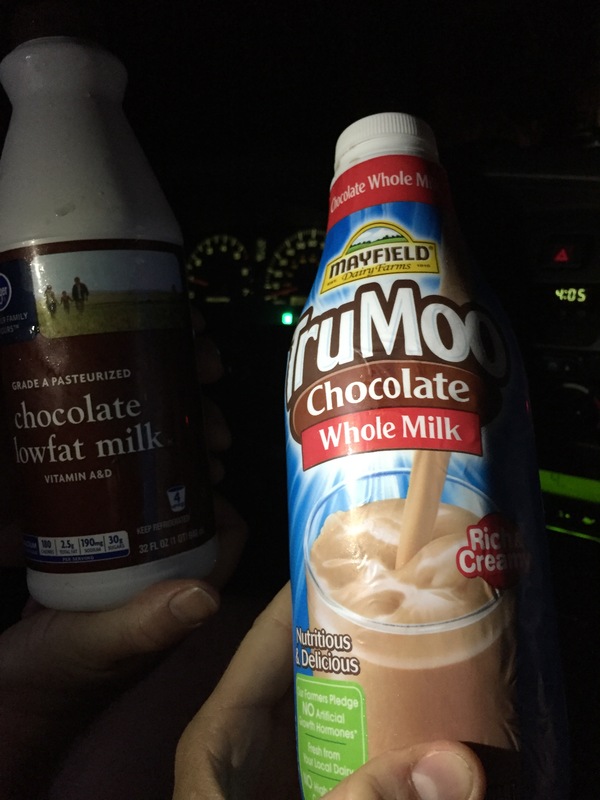 We celebrated by sipping ice cold chocolate milk as we drove to pick up my car and head home. We both had prior commitments on Sunday, but tried to sleep as much as possible. We spent time on Monday discussing our thoughts. Neither of us remembered feeling quite so poorly after the last time, but Tina assures me that I was in plenty of pain back then, too. We both agree that it will be a long time before we forget how difficult those last few miles were and the way our bodies felt the day after! I’m not sure what we expected after taking over 100,000 steps with little to no rest. Shawn wrote a nice article 4 years ago regarding nutrition (Shawn’s article). We basically followed the same guidance this time around. Below is a photo of some of the things that I carried. At the car, I had turkey and swiss stuffed inside pita bread. I also had several spoonfuls of chocolate hazelnut PaleoButter inside pita bread. (buy it here). 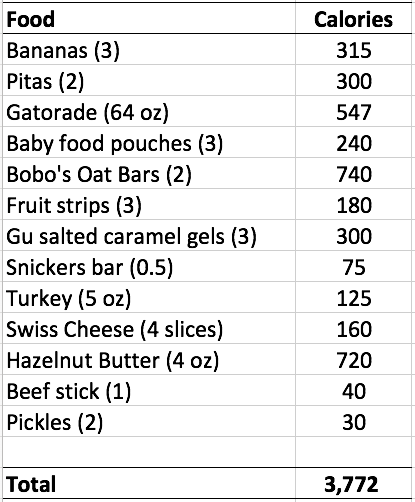 Here is a complete list of what I (Brian) ate, along with the calorie count. I would guess that we were burning between 300 and 500 calories per hour, depending on whether we were going up or down hill. Our heart rates averaged 125 bpm while climbing and 100 bpm during the descents. After adding up the total calories that I consumed, there is no wonder that I ran out of energy. 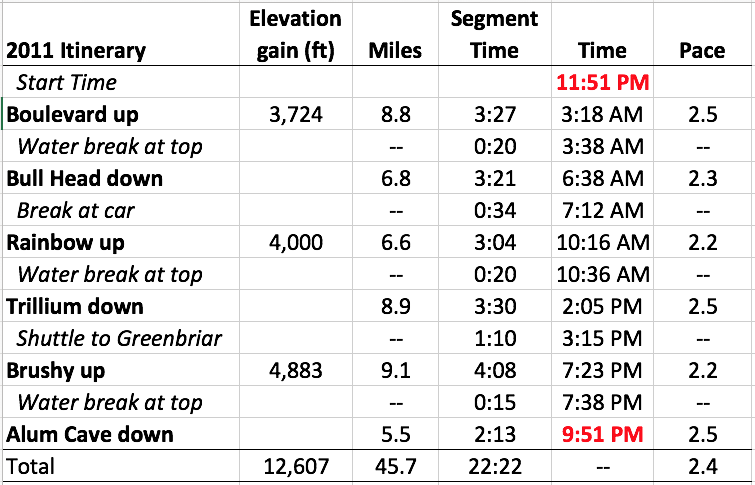 I had been consuming around 300 calories per hour during the first 30 miles, but didn’t feel hungry on the final time up the mountain. I ended up consuming very little on this last leg. 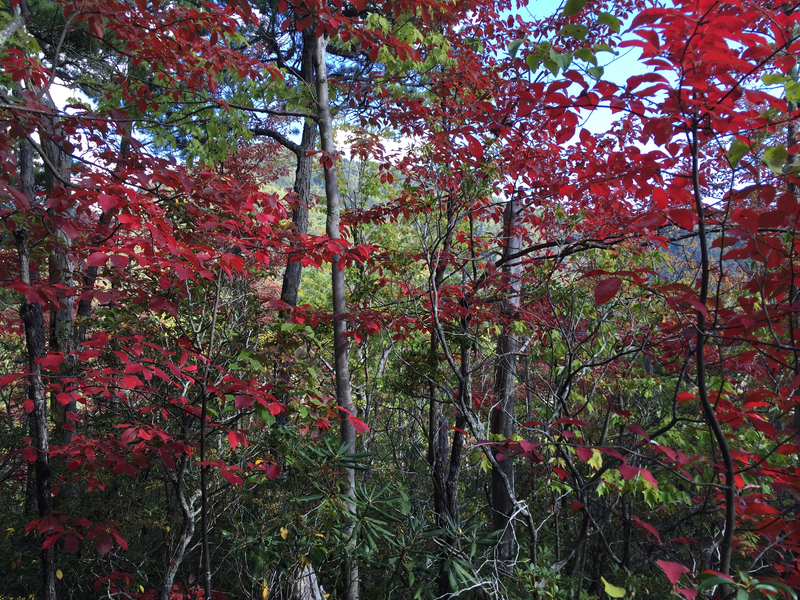 Overall, I averaged 193 calories per hour during the entire hike – which was not enough. Lesson learned: EAT! Even when you don’t feel like it! Bright headlamps and spirited conversation sped our journey along. Before we knew it, we were leaving the AT to begin the Boulevard Trail. We encountered dense fog for a few miles, which prevented our headlamp beams from reaching the ground. It’s weird what happens to your eyesight when you can only see a white glow about 4 feet on front of you. Eventually, we climbed above the layer of fog and were able to enjoy a near full moon, Jupiter and a sky full of stars. Mountain landscapes take on a different kind of beauty under a full moon. After nearly 3.5 hours, we reached the top. We stopped at the Myrtle Point trail junction and High Point long enough to grab a photo and then proceeded to the lodge. We spent about 20 minutes eating a snack and filling up our water bladders before beginning our descent down Bull Head Trail. The highlight of this slow descent in the dark was watching Davis sleep walk. In fact, all of our bodies were telling us that we shouldn’t be awake at 4am! Hiking in the dark has it’s own challenges and it’s really kind of boring since you can’t see anything except the heels of the guy in front of you. We made it to our cars as daylight was breaking. After refueling, filling our water bladders, and spending about 30 minutes off of our feet, we began the unrelenting ascent of Rainbow Falls Trail (+4,000′). Including a snack break along the way, we reached the top in about 3 hours, marking the halfway point of our journey. Tyler wanted to be sure it was mentioned that Rainbow Falls is the “worst trail in the universe”. A word about the weather: we couldn’t have asked for better hiking conditions. We had light sprinkles once; temps varied between low 40’s and low 60’s. Short sleeves or no shirt (Davis) were worn on the way up each time. A light jacket was needed from time to time. After a 20 minute lunch break at the top, we began the rocky descent of Trillium gap trail. There was lots of evidence that the llamas had been on the trail the day before. Once we passed Grotto Falls, we saw many “civilians”, which led us to believe that the trailhead was nearby. Within a mile, we encountered the 2.5 mile connector trail that lead us back over to our cars. This is a relatively easy trail, except for the fact that it seemed to be 10 miles long. When we arrived at the cars around 2pm, Woody was there with Subway sandwiches. We refilled on water and snacks, including Honey Stinger energy gels and chews, and Woody shuttled us to Greenbriar for the final leg of our journey. Perhaps the most challenging aspect of this trip was getting out of the car and starting to climb again. We started up the Porter Creek trail/gravel road about 3:15pm, with only 9.1 miles left to climb. Shawn blazed the way along the Brushy Mountain Trail. This trail definitely earned its name, with stinging nettle all along the sides of the trail. We made it to the top for the final time around 7:30pm and spent about 25 minutes recovering before the final 5.5 mile descent down Alum Cave Trail. Aching knees and sore feet kept us at a reasonably slow pace. Nonetheless, we averaged 2.7 mph on the way down. The sand and fog at Alum Cave Bluffs made it hard to see where to go. The sand reflected the light in a way that made it look like freshly fallen snow and it hid the rocks causing us to trip a few times. After descending the stairs through the cave, we knew we had about 1 mile to go. As we followed the river for that final stretch, we were convinced that someone had moved the bridge that leads over to the parking area. We shouted for joy when we finally saw it. When we neared the parking area, Woody was waiting for us with a bucket of KFC and a cooler of root beer and ginger ale. 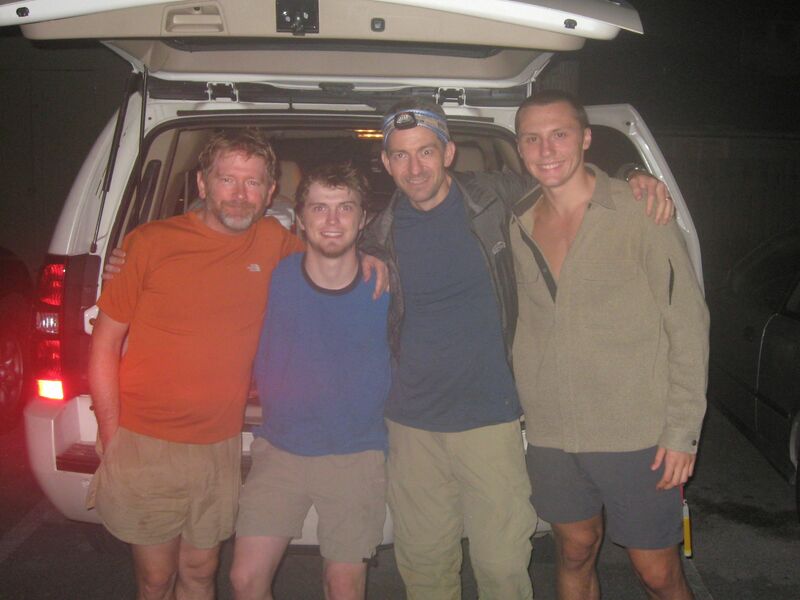 We completed our journey in 22 hours and 2 minutes, with an overall average pace of 2.4 mph. We were physically exhausted, but emotionally satisfied. Davis posted on Facebook that this was truly a ONCE in a lifetime opportunity. I think the rest of us would agree… at least until the soreness and bad memories wear off. To be true to my own preaching I decided to check my gear against the list. Pocketknife – CHECK I have a light weight backpacker’s single locking blade by Gerber. Extra Clothing – CHECK I have a nifty jacket made for cyclists mad of TYVECK that is really light and compact and fits into my Camelback M.U.L.E. Rain Gear – CHECK I am carrying a very lightweight backpacker’s poncho. Water Bottle – CHECK My whole pack is a water bottle. Flashlight – CHECK I will be wearing one on my head for the first 6 hours of the hike. Trail Food – BIG CHECK – We have all kinds of high carb, high protein performance food. Matches and Fire Starter – CHECK I debated this one. We are never going to be too far from help or a trail head and the course is very well marker. I decided to go ahead since a lighter is very light. Map and Compass – XXXX… well ok CHECK All the trails up Mt. LeConte are well marked and we have been on all of them. The chances of getting lost are really, really small BUT!!! we have cell phones with GPS so I’ll take a check on that one. So to all those who sat through my sermon about always having the ten essentials, there you go. Practice of the preaching! Time for a spaghetti dinner. Gotta load those carbs!!! 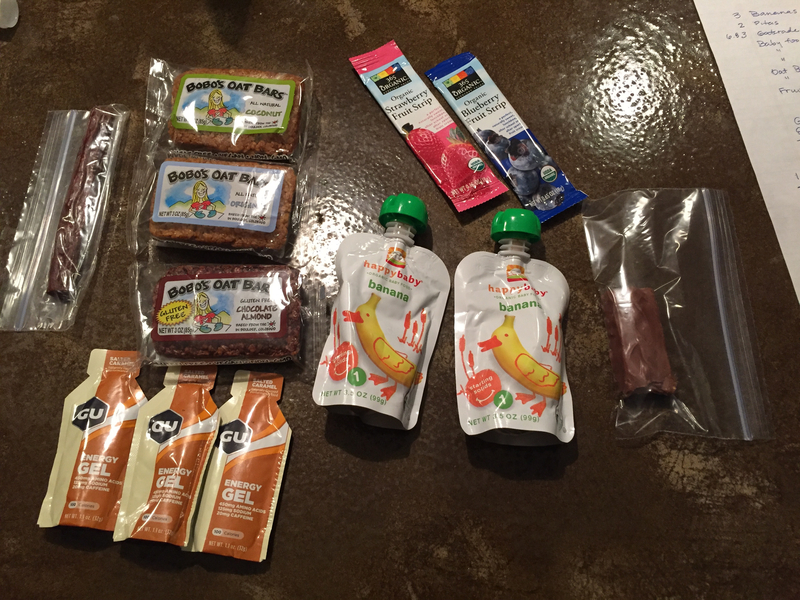 We have been doing a lot of research regarding nutrition during our hike. Although there is a lot written about nutrition for 5k, 10k, and marathons, there has been very little research into optimal nutritional practices during events lasting 6-24 hrs. 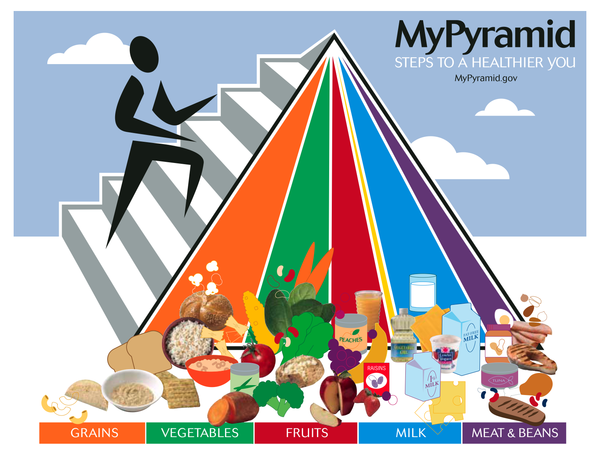 Although our government-backed “food pyramid” looks sort of like Mt. LeConte, I’m not sure it is the solution to our needs. Plus, what kind of pyramid is built like the “new and improved” version below??? Don’t drink too much water – It is believed that 24 oz per hour is the most a body can absorb. Don’t consume too much simple sugar – these cause a burst of insulin, which leads to fatique, mood swings, and bonking. Consume protein, but not too much – 8-15% of calories should come from protein, with 85% coming from complex carbs. The human body can only handle 20-30 g of protein per intake and cannot handle that every hour. Another issue that is common in the ultra world is hyponatraemia – abnormally low levels of sodium in the blood. Ultra-endurance athletes often gulp down sports drinks during their events; by design, such drinks are low in sodium. Ultra-athletes also tend to take in a fair amount of water during competition, believing that such drinking is a great way to ward off dehydration. Of course, the net result is that a lot of sodium can be lost from the body through the sweat glands, while little may be entering the body at the mouth. 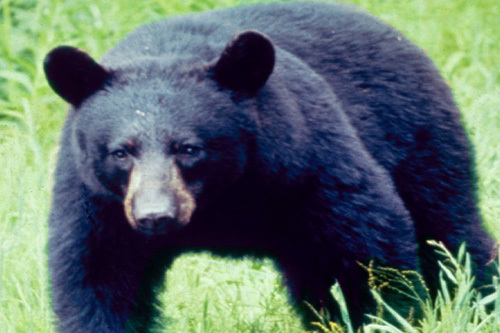 Based on information published by the GSMNP, it looks like we may have a good chance at a bear sighting this weekend. The latest Backcountry Info Poster warns that hikers should use caution at the Mt. 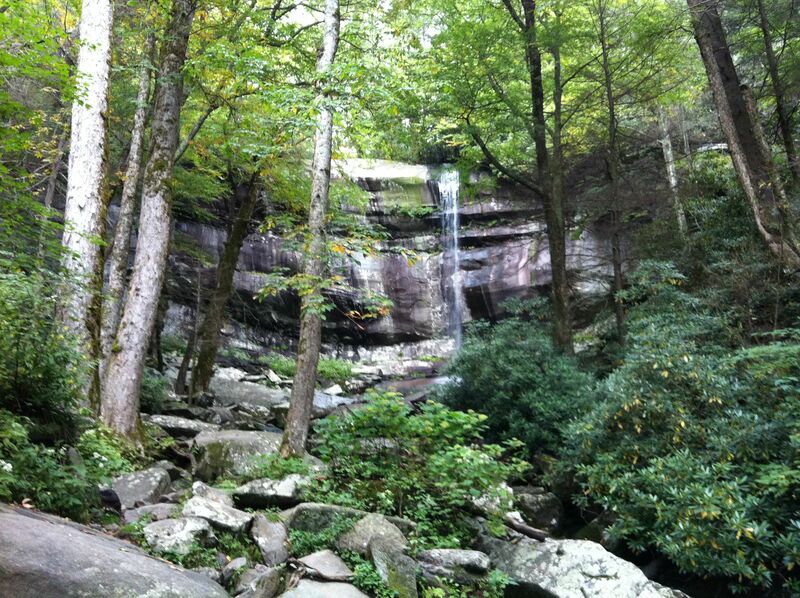 LeConte shelter and on half of the trails that we will hike (Alum Cave, Rainbow Falls, and Trillium Gap). On one of my recent practice hikes, I was on the way back down from LeConte on the Trillium Gap trail and began hearing someone blow a whistle loudly every few seconds. I picked up the pace, thinking that someone was in trouble. In a short time, I approached a family that was on their way up. They had seen a bear earlier in the day and decided to blow their whistle regularly to ensure that they didn’t see another one. I wouldn’t mind seeing a bear, I just hope we don’t have any more encounters with yellow jackets! The extended forecast that includes the 24-hr period when we will attempt LeConte (Sept. 17) is indicating that we couldn’t have asked for more perfect hiking weather. The 10-day forecast below is for Gatlinburg; we can expect temps to be just a bit cooler on LeConte, but I like the sound of “sunny”. Well, I’m not sure about how fantastic we are, but there are four of us now. 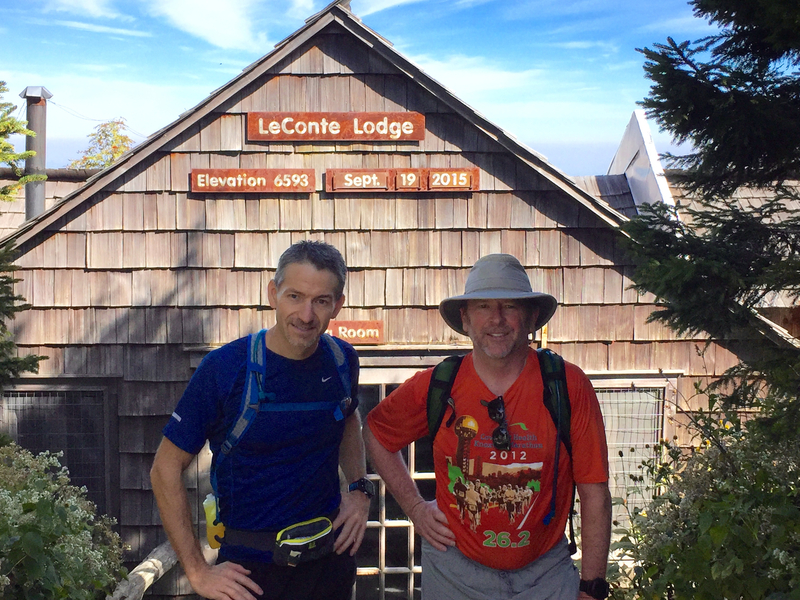 Shawn’s son Tyler did a practice hike to LeConte with us last weekend and got bit with the bug to join us for our 24-hr hike in September. 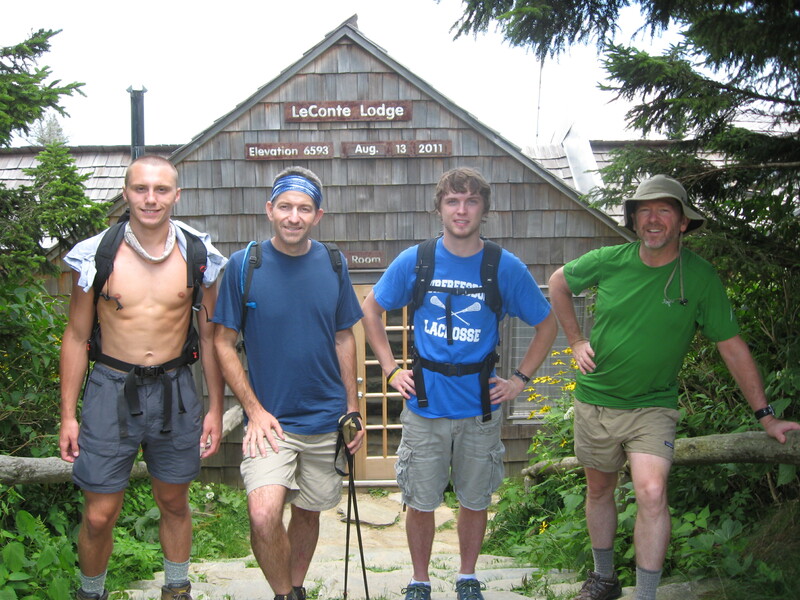 The four of us hiked well together as a team and all have a similar hiking pace. Now we’ll have 2 young guys to lead the way and identify the yellowjacket nests for us ;-).